This is an interesting article. It appears to me that the heel bulbs have been surgically removed. The heels seem fairly contracted, but without the bulbs,...the back of the hoof just looks weird. 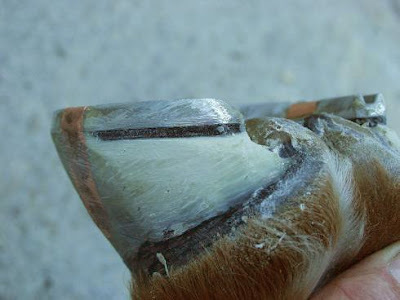 If the hoof needs this drastic of a repair, we need to rethink what we're doing to cause the problem. 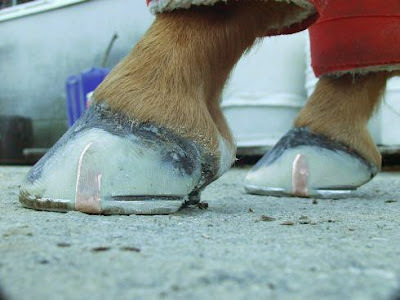 Dr Robert Bowker dictates that a healthy back-hoof is the most important aspect of a healthy hoof, yet the back part of this hoof has been nearly completely replaced by artificial material. 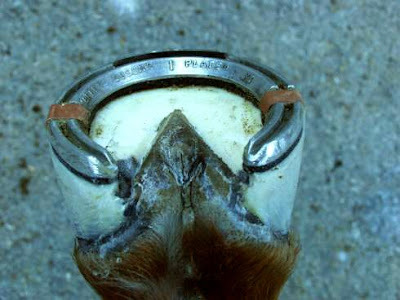 Are partial or even full prosthetic devices legal in the racing industry? Horses don't need their hooves anymore because humans can just replace them with plastic? How can that be right? I am agreeing with Pat. Are thee horses being raced with the issues that require rebuilding? And glue on shoes? I hope not. Everyone seems a bit too eager to judge this technique. It seems to be no more of a "prosthetic" than the old lace and patch. If the technique is un-aesthetic, but effective, then let's not throw out the baby with the bath water. If you think that race horses with inherently bad feet should not be allowed to succeed and procreate then you might be right, but I suggest, a little out of touch with reality. It seems that the practitioner is onto something good, and the proof is in the putting.